Signs and tags are an important part of work area safety. They protect workers, visitors and the general public. If there is a potential hazard, signs must be visible at all times. OSHA has specific regulations pertaining to signs, symbols and tags. OSHA Standard 1910.145(a)(1) Accident Prevention Signs & Tags states specifications apply to the design, application, and use of signs or symbols (….) that indicate and, insofar as possible, define specific hazards that could harm workers or the public, or both, or to property damage. These specifications are intended to cover all safety signs except those designed for streets, highways, and railroads. These specifications do not apply to plant bulletin boards or to safety posters. Sign refers to a permanent or temporary notice or placard that provides a warning or safety instructions for industrial workers or members of the public who may be exposed to hazards. Tag is a kind of sign usually made of card, paper, pasteboard, plastic or other material used to identify a hazardous condition. Tags are usually used temporarily. All safety signs should be visible and legible. If an active sign is vandalized, becomes rusted, or is coming off the affixed location, it must be replaced immediately. Any sign that is no longer relevant should be covered or removed immediately. OSHA Standard 1910.145(c)(1) Danger Signs. There shall be no variation in the type of design of signs posted to warn of specific dangers and radiation hazards. All employees shall be instructed that danger signs indicate immediate danger and that special precautions are necessary. Danger signs indicate that there is an immediate threat and special precautions are necessary. Red should be the main color on the top of a black and white Danger sign. Don’t assume everyone is aware of clear and present danger, signs are important! 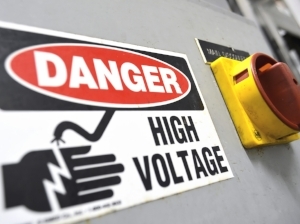 Use Danger signs to mark hazardous areas to prevent potential serious injuries to employees and others that could be in the area at any time. Examples of workplace danger safety signs and tags. OSHA Standard 1910.145(c)(2) Caution Signs. Caution signs shall be used only to warn against potential hazards or to caution against unsafe practices. All employees shall be instructed that caution signs indicate a possible hazard against which proper precaution should be taken. Caution signs warn against potential hazards or caution against unsafe practices, that if not avoided, could result in minor or moderate injury. Caution signs are yellow and black to ensure they are easily visible. Examples of workplace caution safety signs and tags. OSHA Standard 1910.145(f)(7) Warning Tags. Warning tags may be used to represent a hazard level between "Caution" and "Danger," instead of the required "Caution" tag, provided that they have a signal word of "Warning," an appropriate major message, and otherwise meet the criteria of this section. Warning signs indicate a potentially hazardous situation. Accident prevention tags are used to prevent accidental injury or illness to employees who are exposed to hazardous conditions that may be unexpected or not readily apparent. Tags shall be used only until the identified hazard is eliminated or the hazardous operation is completed. Tags don’t need to be used where signs, barricades or other means of protection are being used. A biological hazard warning sign or tag shall be used to signify the actual or potential presence of a biohazard and to identify equipment, containers, rooms, materials, or experimental animals which contain, or are contaminated with, viable hazardous agents. Examples of workplace warning safety signs and tags. OSHA Standard 1910.145(c)(3) Safety Instruction Signs. Safety instruction signs shall be used where there is a need for general instructions and suggestions relative to safety measures. Safety Instruction signs are used to provide information, procedures or instructions. Notice signs are often blue and provide information that is considered important but not directly hazardous (example: security or hygiene). Examples of other workplace safety signs. A membership to Weeklysafety.com comes at a very low price that never goes up no matter how many employees you have and no matter how many awesome safety topics you use. You don’t need any fancy software, employees don’t need to download an app, and it's very easy to get started. Included in your membership are hundreds of safety topics that you can use for your safety meetings, toolbox talks and safety moments including a safety meeting topic like this one that covers Safety Signs and Tags in the workplace.